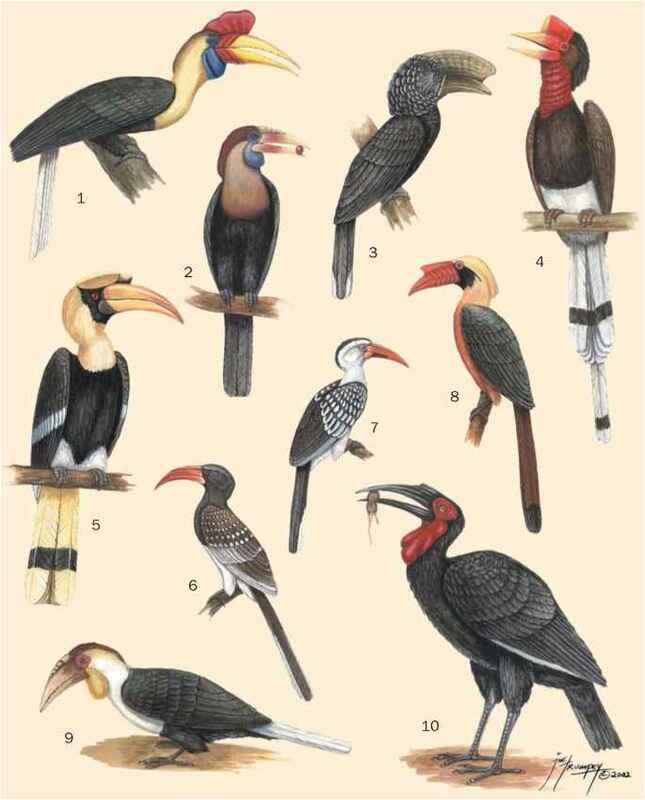 Bucco nigrifrons Spix, 1824, Rio Solimoes, Brazil. Two subspecies recognized. French: Barbacou unicolore; German: Schwarzstirntrappist; Spanish: Manja Unicolor. 10.2-11.4 in (26-29 cm); 2.4-3.5 oz (68-98 g). Relatively slender and long tailed for a puffbird, entirely sooty black, darker around bill and paler ventrally. Bill bright red and legs black. 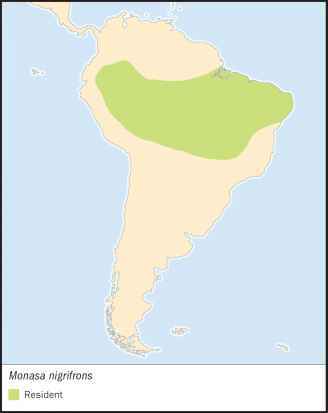 M. n. nigrifrons: southeastern Colombia, eastern Ecuador, eastern Peru, much of Amazonian Brazil; M. n. canescens: eastern Bolivia. Strong affinity to tall forest or regrowth on lakesides, riversides, and floodplains; also igapo and varzea, but generally absent from terra-firme forest. Group territorial, up to six individuals constantly foraging together noisily, often conspicuous in mixed-species foraging flocks. Groups perch from lower strata to subcanopy, primarily taking insect prey (Lepidoptera, Orthoptera, Hymenoptera) in flight, but regularly from ground or foliage. Also reported catching small lizards, and following army ant swarms and primate troops to feed on flushed prey. Lays about 3 eggs in nest burrows dug into level or slightly sloping ground. Incubation and fledging periods unknown. Presumed to be a cooperative breeder as groups visit nest area. Not threatened. A common bird throughout most of its range.